For the kid in 1953 who’d followed these instructions, there were few things more exciting than the package that followed a week or so later. Sure, to the cynical 21st century eye, it contained little more than a plastic sheet and a few crayons. But to that child – it was nothing short of magic. Winky Dink and You was a short-lived TV show from the 1950s in which kids could lay their plastic sheets over the television and use these ‘magic’ crayons to trace over the screen. Again, it sounds pretty archaic to us – but try telling that to the kids who used that kit to help Winky Dink save the world. The show itself was short-lived. But the idea of interactivity has proved more resilient. Many historians, experts and deep thinkers have credited Winky Dink with the idea of screens as ‘two-way’ windows – platforms not only for passive observation, but active participation. In many ways, interactive video is the modern-day Winky Dink. Interactivity doesn’t reinvent video, just as Winky Dink didn’t reinvent television. But it augments it. It brings a new layer of participation which deepens engagement and creates new possibilities for content that entertains, educates, empowers informs and – above all – inspires action. But interactive video takes it to the next level by allowing viewer participation and interaction beyond pause, rewind and fast-forward. The viewer controls the content they see by taking some action. They might click interactive ‘hotspots’ on the screen that take them to different parts of the video; they might fill out a form; they might answer a question; they might add a product to the cart in their player window. Storytelling: By making the viewer the ‘hero’ of your story, you can invite them to make decisions that dictate how the story unfolds. This is ‘Choose your own Adventure’ for the 21st Century. Knowledge validation: Using your video for training or education? Why not ask questions periodically during the video to keep the viewer engaged, check they’re paying attention and validate their knowledge? Data Collection: Form functionality allows you to capture contact details for lead generation. This means, in theory, you can ‘gate’ certain parts of the video – or pieces of content – so that your user needs to complete the form before they can access them. Product Sales: With the ability to add products to cart from within the player window, you can get your customers to the checkout in fewer clicks and less time. 83% of marketers that have used interactive video as a part of their strategy say it was successful, which – for an emerging marketing technique which many marketers and customers are still getting to grips with – is pretty impressive. When you have a series of different videos explaining different concepts, topics or ideas, you can start with a menu screen that lays out the options and invites the viewer to click one. In the example above, we created 3 short videos with facts about Wimbledon – to coincide with the world’s favourite tennis tournament. The viewer is able to access whichever one they find most interesting from a simple menu screen. The ‘content on demand’ approach works just as well for an educational video series. For example, you might want to invite your viewer to click to learn more about a particular product feature, policy or topic. In the above example, viewers are invited to click a particular icon to learn more about Cogeco Peer 1’s connectivity services. And here’s a great example of the storytelling power of interactive video. In this one, the viewer is able to make decisions that influence how the story plays out. Their decisions and input dictate the viewer’s progress through the video and, ultimately, whether they experience a good or bad ending. We speak to a lot of marketers who agree that interactive video is a cool concept but are intimidated by the technicalities of how it works. How is the video made? How does the functionality overlay the video? Where is the video hosted? Basically…how does it work?! Obviously, the first thing you need is, of course, your video content. If you already have a ‘series’ of video content like in our Wimbledon example above, then you can skip straight to adding interactive functionality. If, however, you’re planning on creating an interactive experience from scratch, it’s important to keep the technical stuff in mind from the very earliest stage of your project. This brings us to step one. Do your research. Understand what is and isn’t possible. You might have the best ever idea for an interactive experience, but the whole idea could be based on something which is technically difficult or even impossible to achieve. Reading articles like this one is a good start – we’ve outlined above some of the most common functionality you can expect. But reach out and talk to experts if you’re unsure and have questions – we’re always available to help with anything you might need. Next up, we recommend that you write a script for your video. This applies whether you’re planning an animated video or live action. Our script document for a typical linear video project has two columns – voiceover, and action on screen. But we add a third column labelled ‘Interactive Functionality’ for interactive videos. This ensures you can consider the options available throughout the video from the earliest stage of its conception. You might also find it helpful to create a mind map or flowchart that illustrates the various branching parts of the video. You can do this simply enough using Google Slides or draw.io. Next, you should create a storyboard for your video. This is particularly important if your video is to be animated, but even if you’re filming live action – it’s worth sketching up a storyboard so you know exactly what you want from each scene. When we create a storyboard, we create the exact graphics that will appear in the video, and lay them out slide by slide in a Google Slides presentation. When your video is complete, it’s time to add the actual interactive functionality that brings the whole experience together. This involves choosing an interactive video platform and uploading the various pieces of video content – then piecing them together with the functionality and menus required. It looks a little bit like this when you lay it out in a platform like Rapt Media. The purple lines in the screenshot above illustrate the potential ‘paths’ that can be taken by the viewer. This can be edited using drag-and-drop functionality until you’re totally happy. The video can then be embedded onto your website, blog or landing page by copying and pasting a simple snippet of code. The world of video is moving so fast, and new trends are emerging all the time. 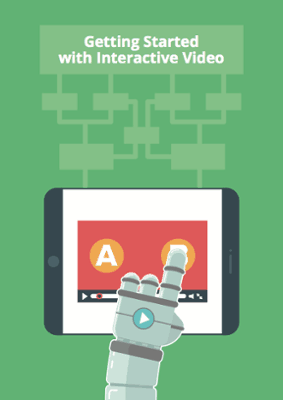 In our humble opinion, interactive video is up there with the most exciting. The creative opportunities are endless, and the appeal is likely to grow with the potential of the technology itself! To find out more about interactive video and to see some truly exceptional examples, read our article: The 9 Best Interactive Videos of All Time.